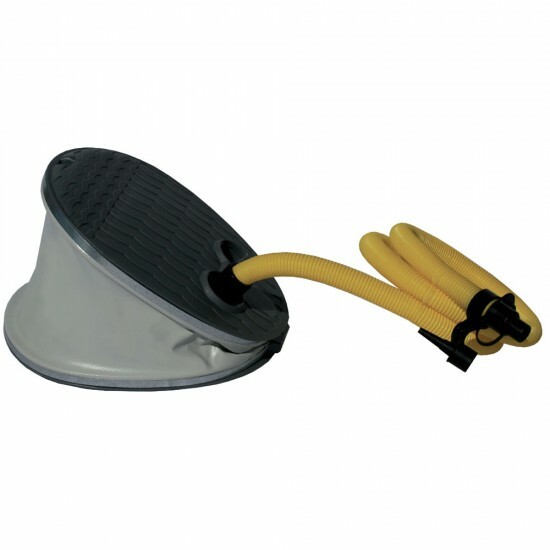 High-volume bellows style foot pump. Well-suited to the needs of watersports enthusiasts, this durable, high-volume bellows-style foot pump makes quick work of pumping small and medium sized inflatables to moderate pressure (2.6 psi max). Handy for topping off air pressure. Includes Kink-proof hose with attached fittings for Stem, Boston, Rapid Inflate, Fish Eye, and Halkey-Roberts valves. NOTE: A good option for boats with XP floor or other low-pressure watersports equipment. JOMBO 23.5" Extra High Pressure Hand Pump max. 20psi for iSUP paddle board..
Aquaglide SUP Double Action Pump Our Dual-Action SUP Pump is an extremely high-pressure push pump with a high-pressure gauge and an assortment of..
GALA Series-F tenders are represented across 4 models and constitute a new and fresh design in class of foldable boats with floorboards or airdeck. Ou..
● Item: 58-5217626● Capacity: 2● Warranty: Limited 1 year● Dimensions: L 5' x W 6.5' x H 0.4'(L 1,5m x W 2m x H 0,1m)● Min. Water Depth: 4' (1,2 m)● B..
Aquaglide Platinum - Summit Express..
Aquaglide Platinum - Freefall Extreme.. Jungle Gym for the water. Climb to the top of the Jungle! Jungle Joe™ represents a paradigm shift in aquapark play structures. Multi-tiered climbing s..